An artist's illustration shows what the Jurassic-age crocodile may have looked like in the water. EUGENE, Oregon -- An ancient sea-going crocodile has surfaced from the rocks of Crook County in eastern Oregon. Really. It's discovery by the North American Research Group (NARG), whose members were digging for Jurassic-age mollusks known as ammonites, is another confirmation that the Blue Mountains consist of rocks that traveled from somewhere in the Far East, says retired University of Oregon geologist William Orr, who was called in to examine the find for the state. The remains - about 50 percent of a 6- to 8-foot reptile, including long, needlepoint teeth - were found imbedded in Jurassic rock on private property in the Snowshoe Formation of the Izee Terrane south of Dayville, Ore. Rocks containing the fossils were slowly cut out of the rock, after NARG members realized that the linear appearance of the fossils in the region's hard rocks suggested that a whole creature had been found, Orr said. "This taxon was a crocodile-like creature but had a fish tail," said Orr, a NARG adviser and director of the Thomas Condon State Museum of Fossils at the University of Oregon. "This creature lived in Jurassic times, so it's 150 to 180 million years old. It probably lived in an area from Japan to East Timor, somewhere in the western Pacific in a tropical estuarine environment." The remains of the crocodile, believed to be from the species Thalattosuchia and member of the Metriorhynchids group, now belong to the state, Orr said. The remains will be displayed on loan to the Rice Northwest Museum of Rocks and Minerals in Hillsboro, Ore., after undergoing an expected two-year analysis at the University of Iowa. The Hillsboro museum is operated by NARG, whose members are private researchers with experience and interests in paleontology, paleonbotany and geology who study the Pacific Northwest. Andrew Bland, one of nine NARG members seeking fossils, first located the crocodile bones during a weekend trip in October 2005. "I followed the bone fragments I was finding up hill a few feet to the area they were weathering out of," Bland wrote in a group newsletter. "I started to dig and found more bone material. It was hard for me to stop digging, as I wanted to uncover more." Thalattosuchia, a predator believed to have been common around much of the world during the Jurassic Period (142 million to 208 million years ago) was named in 1901 by German researcher Eberhard Fraas. 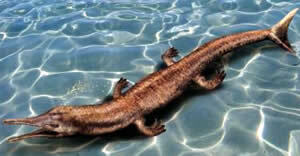 Based on locations where fossils have been found, scientists have theorized that Thalattosuchians may have moved from semi-aquatic freshwater reptiles into fully ocean forms. Fossils similar to the Oregon crocodile appear today in many areas around South China, Orr said. Orr theorizes that the remains in Oregon migrated eastward in rock by continental drift, a theory of land movement in geological time now encompassed under plate tectonics. Terrane formations, such as those where these fossils were found, are believed to be portions of the earth's crust riding apart of a plate that is pushed upward at contact with another plate. The reptiles' short stubby legs would have allowed them to move about land, where they may have laid eggs. But also, the creatures may have had webbed feet, which, in combination with the fish-like tail, would have made them rapid swimmers, allowing them to hunt along the surface of aquatic environments, scientists have theorized. Fossils from other crocodile families and other reptiles, especially ichthyosoaurs, from the Mesozoic Era (65 million to 248 million years ago) have been found previously in Oregon, but none have been as old as the newly found crocodile, Orr said. "While fossil marine crocodiles frequently occur in Jurassic rocks of Europe and Africa, they are scarce in North America," Orr and his wife Elizabeth L. Orr, a courtesy research assistant in the department of geological sciences, noted in their book "Oregon Fossils." And while these reptiles lived during the age of dinosaurs, only a single fragmentary dinosaur bone, from the Cretaceous Period (65 million to 144 million years ago), has been discovered in the state. The new discovery, Orr said, suggests that dinosaur fossils "must be out there somewhere, but we just haven't looked hard enough." it is the most amazing creature i have ever seen!! I love crocodiles because vs sharks croc wins and I always wanted to se a preosthoric croc.I think a lioplordo is a giant sea croc. If you really loved them you'd learn how to spell liopleurodon, and especially prehistoric. Anyhow. Liopleurodon is definately not a crocodile. If you study it, not just look at it, then you'd know.